Highlighting the latest functional art installations crafted by our workers. 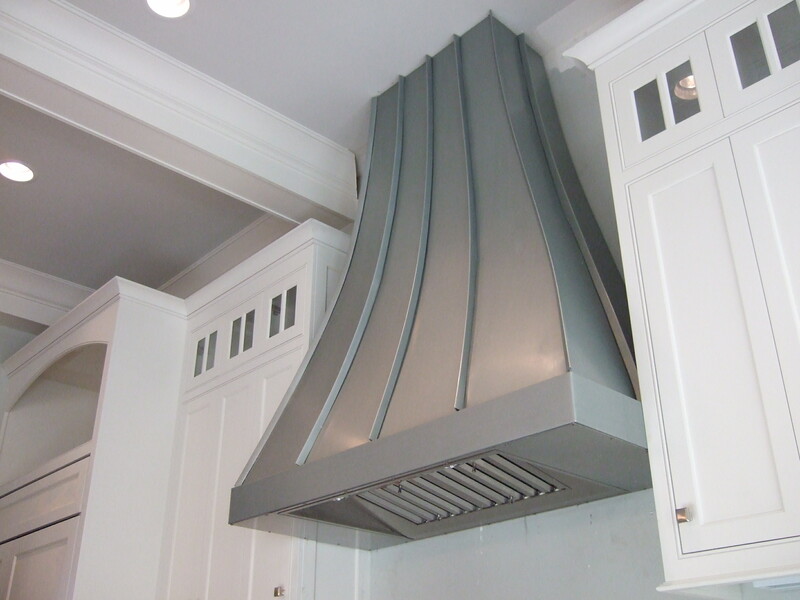 Our company fabricates, finishes and installs venting and non-venting custom hoods as accent pieces in homes across Middle Tennessee and Southern Kentucky. We can manufacture the venting insert or you can bring us a factory-made one that we form the hood around. Whether your style is contemporary, transitional, old world, or traditional RD Herbert & Sons craftsmen can create the perfect focal point for your kitchen. 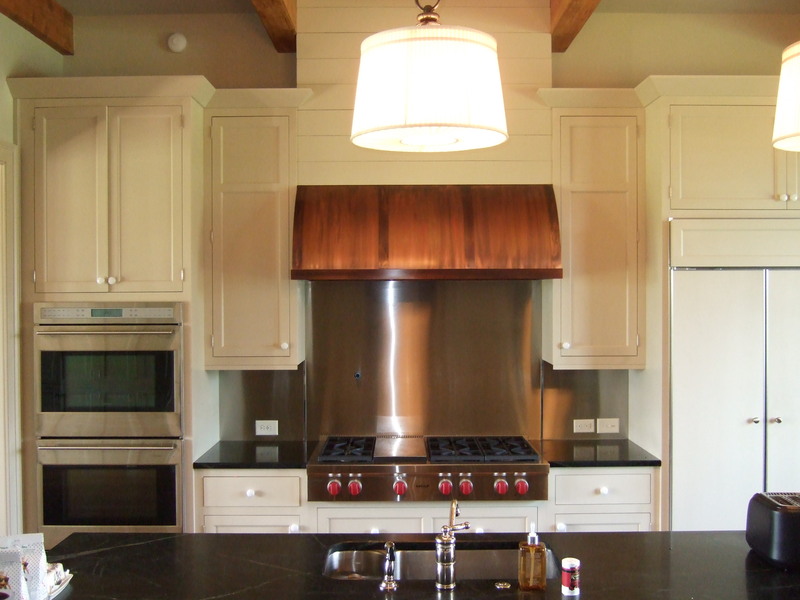 See more Custom Kitchen Hoods fabricated by RD Herbert & Sons on Facebook. 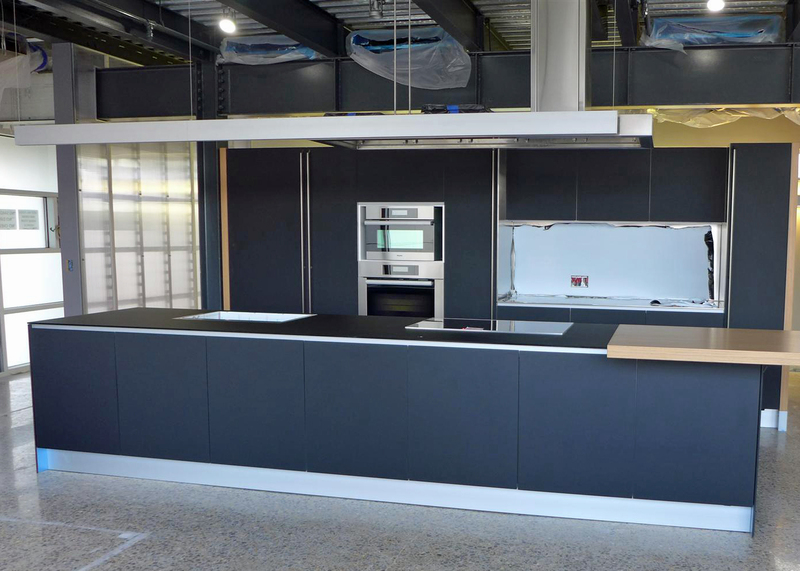 Contemporary 24 ga Stainless Steel Kitchen Hood in a 3b Finish with accompanying square duct cover. 16 oz Copper Island Hood in a old world feel with rivets & custom aged patina finish with linear striations. 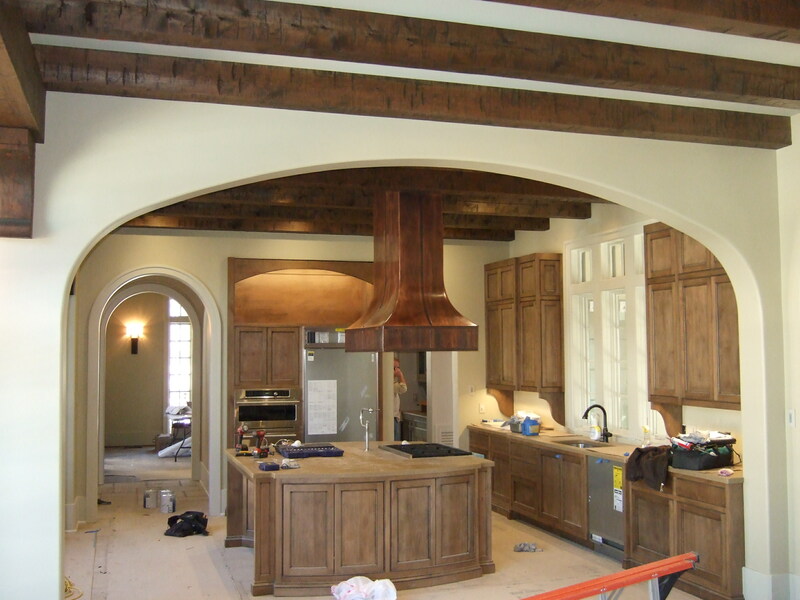 Custom kitchen hood formed from 32 oz Copper Hood with 1/4″ Flat Bar trim. RD Herbert & Sons designed, fabricated & installed the Stainless Steel vent insert liner also. Sheet: Available in .040—3/8” gauges/thicknesses, with selected finishes for selected gauges. Lighter then most other metals and 1/3 the density of steel, this material is resistant to weather, common atmospheric gasses and a wide range of liquids. It has the ability to be rolled to very thin gauges and still worked and formed. Mill Finish is the natural appearance of aluminum as it comes from the rolling mill. There is no external mechanical or chemical finishing to the surface of the metal. Clear Anodized An electrochemical process that enhances the aluminum’s natural oxide surface layer by forming an even more durable oxide film that can have a variety of colors. Slight variations occur in texture, color, grain configurations and finish acceptance of materials used. 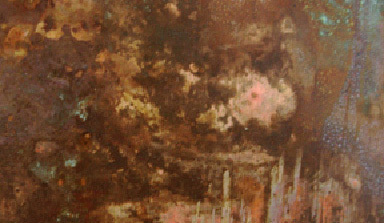 Therefore, finished pieces may vary in tone or character from this image. Please order a sample for a more true representation of the finished piece. Tread Bright is known for its cosmetic qualities and structural qualities in heavy thicknesses. The 6061 alloy has a mill finish with the raised “diamond” pattern and is used when structural strength is a requirement. Tube & Pipe: Includes seamless and welded hollow products that may have cross sections that are round, square, rectangular or a special shape. As-welded tube & pipe are produced by forming mill finished 2B sheet, strip or plate into the desired shape, welding the seam, and then cleaning the welds to restore corrosion resistance. This finish is specified for applications where corrosion resistance is important and aesthetics are not a concern. Round, square, and rectangular products are available in the as-welded condition. The weld is visible. As-welded & Bright Annealed tube or pipe has been formed, welded, and heat treated (annealing) in a controlled atmosphere to obtain a uniform microstructure and desired mechanical properties. Bright annealing produces a bright, scale free finish that is suitable for use in corrosive applications. Cold Drawn Tubing is used for applications requiring precise outside or inside diameter tolerances and smooth surface finishes. It is also specified for applications that require the higher strength of a cold worked product. Cold drawing produces a relatively smooth finish and increases the strength of the stainless steel. Open Air Annealed & Pickled products have visible non-uniform dark scale on their surface. Annealing produces a uniform microstructure and ensures that the product will meet mechanical property requirements. This could be specified as an intermediate finish when further processing is expected or for use in elevated temperature applications. The scale produced during open air annealing is detrimental to corrosion performance and should be removed if the product will be used in an application where corrosion resistance is the primary concern. 180-Grit Polish is the most common polished finish. Rougher grits (80 and 120-grit) are also available. Polishing can be specified on the inside or outside diameter or on both. Seamless, welded or cold drawn products can be polished. Polishing is available on round, square and rectangular tubing. On round products it is typically circumferential but some polishers can longitudinally polish. Other shapes are longitudinally polished. Finer Polished Finishes (240, 280 and 320 grit) are produced for applications where a smoother finish is desired for aesthetic applications and where improved corrosion resistance or clean-ability is needed. Higher grit numbers produce smoother, finer and more reflective finishes. Photos of both a 240 and 320 grit finish are provided for comparison. Buffed Finishes are achieved by mechanical polishing (typically to 320-grit) and then buffing. Like the No. 7 and No. 8 sheet finishes, different levels of buffing are available and the visibility of residual polishing lines can vary. Buffed finishes are used for aesthetic applications and where a higher level of corrosion resistance or clean-ability is desired. A visual standard is suggested if the application is aesthetic, and a maximum surface roughness should be specified if the goal is improved corrosion resistance or clean-ability. 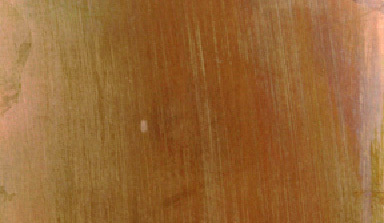 The photo shows a highly buffed finish that is equivalent to a No. 8 sheet finish. The remnants of polishing lines are only visible upon close examination. additional information on this product. Bar: from 1/4 inch to 10 inches wide and has a thickness of 1/8 inch to 8 inches. Flats that are formed using hot or cold rolling, forging, cold drawing or extrusion. Hot Rolled, Forged, Pressed or Extruded products have a non-uniform dark appearance from hot processing. 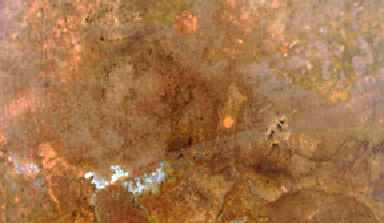 The dark coloration is associated with the surface oxide scale. This is an interim finish that is sometimes purchased when machining or other forming or finishing operations are planned. Cold Drawn or Rolled products have a relatively uniform dull silver appearance although forming marks may be visible. This is often an interim finish when further machining, drilling or finishing is planned. For applications like shafts, the cold drawn finish is typically peeled before use. Hot Or Cold Drawn, Annealed & Pickled products have been formed, heat-treated (annealed) to obtain a uniform microstructure and desirable mechanical properties, and then pickled to remove the scale that forms during heat-treating. The resulting finish is a uniform dull, silver gray. Pickling restores corrosion resistance and makes the bar suitable for applications where corrosion resistance is required. Examples of a round bar, hexagonal bar, square bar and three extruded shapes are shown. Polished Bar or Shapes have been formed, annealed and pickled prior to polishing. The finish is characterized by long scratch lines from mechanical polishing. There may be machining prior to polishing to achieve desired dimensional tolerances. The polishing is done with polishing belts, which follow the contour of the shape or bar. It does not change the dimensions of the bar or shape. In comparison to grinding, it can produce a smoother finish but grinding produces tighter tolerances. Ground or Centerless Ground Finish is similar in appearance to a polished finish. Circumferential scratch lines from grinding are visible. The finish can vary from coarse to smooth depending on the grinding stone. This finishing technique produces tight tolerances and can correct dimensional problems. Photos and information sourced from: SSINA: Specialty Steel Industry of North America. Visit their site for additional information on this product. Hot-Rolled Or Cold-Rolled & Annealed, Scale Not Removed is specified for heat resisting applications or as an intermediate finish. Scale gives the plate a dark non-uniform appearance. When scale is visible, surface chromium has been lost, and this reduces the stainless steel’s corrosion resistance. Residual scale is not a concern for high temperature applications, but it should be removed if the stainless steel plate is to be used for an application where corrosion resistance is important. Hot-Rolled Or Cold-Rolled, Annealed, Blast Cleaned plate has a dull, gray appearance. After rolling, the coil is heat treated to produce a uniform microstructure (annealing) and to meet mechanical property requirements. Blast cleaning to remove scale is typically done with carbon steel shot, which can leave steel embedded in the surface. This is an intermediate finish that is purchased when there will be further processing, such as machining, that will change the finish appearance. Hot-Rolled or Cold-Rolled, Annealed, Abrasive Cleaned & Pickled is a dull silver gray finish. Finish uniformity varies with plate thickness and thicker sections have a less uniform appearance. There may also be shiny areas if surface defects are removed by grinding. It is the most commonly specified plate finish and it is used for applications where corrosion resistance is important and for heat resisting applications. Hot-Rolled or Cold-Rolled & Annealed or Heat Treated & Surface Cleaned & Polished is generally finished in the same grit range as a No. 3 or No. 4 polished sheet or strip. It is characterized by short, parallel polishing lines, which extend uniformly along the length of the plate. It is obtained by mechanically polishing with gradually finer abrasives. The final finish is generally between 80- and 150-grit but may be finer if specified. Copper is available in 16, 20, 32 & 48 oz thicknesses. Typical sheet width is 48”x120” Most of our copper products can have a patina finish applied including a matte or gloss clear coat. Please note each piece of copper ‘takes’ patina differently. No two copper items ever turn out exactly the same. Each copper item, when completed, ends up with a patina that is in a range of color tones (from lighter to darker). 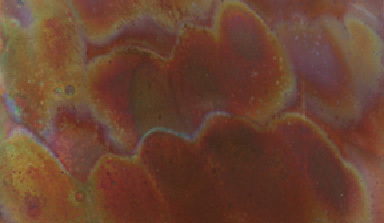 Patina coloration is influenced by material, temperature, and by the individual patina mixture. The combination of these three elements that ultimately dictates the product’s final color and tone. This guarantees you always receive an original unique item. Be aware that different lighting will make the copper look lighter or darker. Copper Facts: antimicrobial, bio-static, recyclable, and the USA is self-sufficient in copper production. Bright Mill: new penny color people associate with copper. Due to the material’s natural ability to patina, or age, over time a clear gloss coat is required to maintain this color. Light Antique Finish: slightly browner than the bright mill finish, close to a cinnamon color. The sanding or hammering processes (outlined below) can be added to the finishes to further define the copper. Medium Antique Finish: mid-brown color ranging from a red undertone to burnt ocher. The sanding or hammering processes (outlined below) can be added to the finishes to further define the copper. Dark Antique Finish: dark brown color leaning toward a mahogany or dark chocolate. With this darker finish, less patina or ageing will happen after installation. The sanding or hammering processes (outlined below) can be added to the finishes to further define the copper. *Non Directional Sanding produced using an orbital sander to create an overall mottled appearance. *Directional Texture is characterized by parallel polishing lines, which extend uniformly along the length of the piece. It is obtained by either mechanically polishing with gradually finer abrasives. There are six standard variations available: fine satin, medium satin, coarse satin, uniform, hand rubbed and brushed. *Hammered copper varies based on closeness of the hammer strokes, size of the hammer and force used during the process. View our projects to see these finishes. Additional information available: Copper.org. Visit their site for additional information on this product. Strip: cold-rolled material that is less than 24 inches wide and has a thickness of 3/16 inch or less. No. 1 Finish has rough, dull, and non-uniform appearance. There may be shiny spots where surface imperfections were removed by grinding. It is generally used in industrial applications, such as equipment for elevated temperature service. No. 2B Finish is a bright cold-rolled finish. The final light cold rolling pass is done using polished rolls, producing a more reflective finish that resembles a cloudy mirror. Finish reflectivity can vary from manufacturer-to-manufacturer and coil-to-coil with some coils looking quite mirror-like and others being fairly dull. No. 2B is a general purpose cold-rolled finish commonly used for all but exceptionally difficult deep drawing applications. No. 2D Finish is a uniform, dull silver-gray finish. Pickling or descaling is necessary after heat treatment to remove the chromium depleted dark surface layer and restore corrosion resistance. Pickling can be the final step in production of this finish, but, when finish uniformity and/or flatness are important, there is a subsequent final light cold rolling pass (skin pass) through dull rolls. Bright Annealed (BA or 2BA) is produced by heat-treating (annealing) in a controlled atmosphere furnace. It has a mirror like appearance but may have some cloudiness and other imperfections. A finish that is designated “BA” has only been bright annealed. A finish that is designated “2BA” has been bright annealed and then passed between highly polished rolls. Bright annealed stainless is sometimes buffed to attain a more mirror-like finish. No. 3 Finish is characterized by short, relatively coarse, parallel polishing lines, which extend uniformly along the length of the coil. It is obtained by either mechanically polishing with gradually finer abrasives or by passing the coil through special rolls, which press a pattern into the surface that simulates the appearance of mechanical abrasion. It is a moderately reflective finish. If a fabricator blends in welds, the resulting polishing lines are usually longer than on product polished by a producer. No. 4 Finish is characterized by short, parallel polishing lines, which extend uniformly along the length of the coil. It is obtained by mechanically polishing a No. 3 finish with gradually finer abrasives. This general-purpose finish is widely used for restaurant and kitchen equipment, storefronts and food processing and dairy equipment. If a fabricator blends in welds, the resulting polishing lines are usually longer than on product polished by a producer. No. 8 Finish is the most reflective polished finish that is covered by the ASTM standards. It is produced in the same manner as the No. 7 finish except that the buffing is continued for an additional five to ten minutes. In comparison to a No. 7 finish, the grit lines are much less visible, but they can be seen if the finish is examined closely. The resulting finish is mirror-like but not a perfect mirror. TR (Temper Rolled) Finish is specified when higher than normal mechanical properties are desired. Different temper levels are available (1/16 Hard, 1/8 Hard, 1/4 Hard, 1/2 Hard, 3/4 hard, Full Hard). These levels are defined by the yield and tensile strengths and elongation. Temper rolling is typically done on polished rolls and it produces a fairly smooth reflective finish. 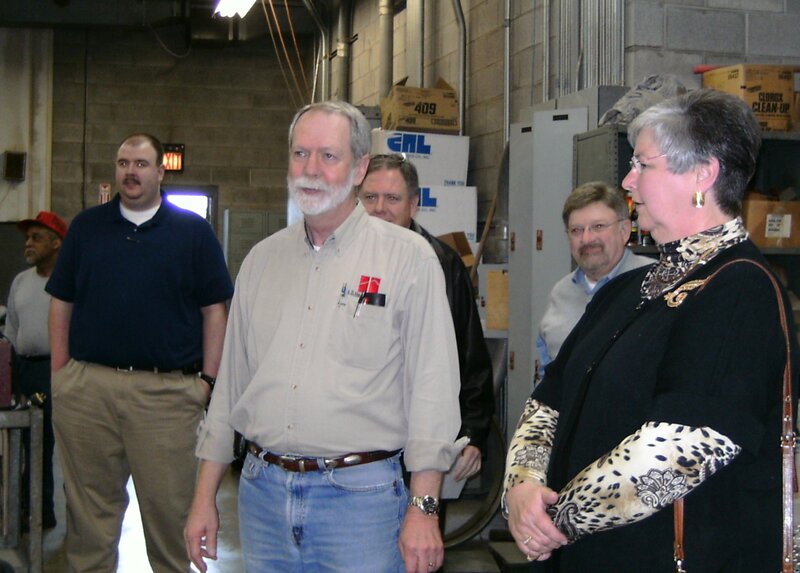 RD Herbert & Sons Company honored Laurence Marston with a retirement luncheon on March 16, 2010. Attendance included Laurence’s’ wife, Janice, and son, Jonathan, current and retired RD Herbert employees, and representatives from Loftis Steel & Aluminum, Schreiber Foods, and AP Specialties. Classic southern fare was provided by McConnell’s Catering Services. After high school, Laurence worked at Container Corporation of America as 1st helper on the printing presses. He served in the US Marine Corps. for 3 years including tours in Vietnam. After receiving an honorable discharge with the rank of NCO-E4 on April 15, 1971 he returned to his position as a press helper before joining the sheet metal union. Laurence started with RD Herbert in January 1974 as a sheet metal Apprentice under the supervision of Morris “Red” Shockley. He worked his way through the ranks to Journeyman and eventually to Superintendent/Estimator, a position he held for 16 1/2 years. 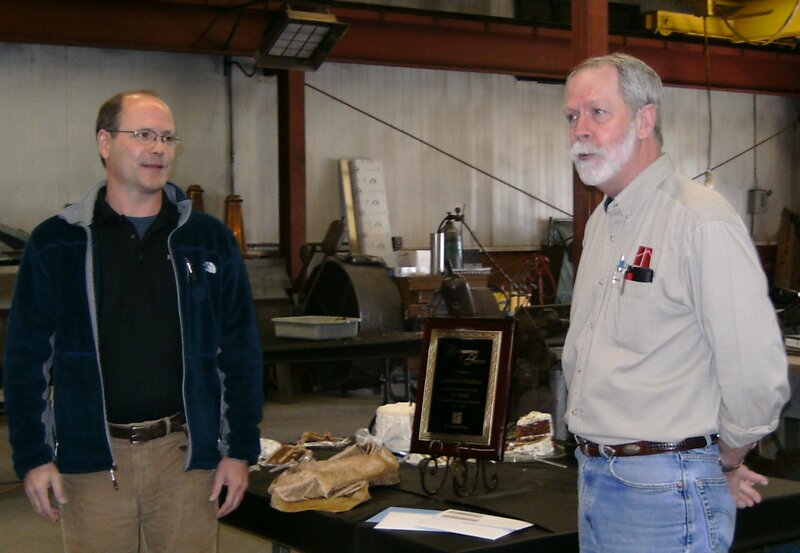 Houston Herbert presented Laurence with a plaque recognizing his 36 years of dedication and hard work with the company. Following his official retirement on Friday, Mark Stribling will assume the duties of Sheet Metal Superintendent and Estimating.